Elia Viviani (Team Sky) took a home victory after a chaotic sprint at the end of stage two of the 2015 Giro d’Italia, narrowly pipping Moreno Hofland (LottoNL-Jumbo) to the line. The stage looked like it would inevitably come down to a sprint with a relatively flat parcours, but the finishing circuit in Genoa was anything but a piece of cake for the riders, with crashes taking a number of riders out of contention, with Heinrich Haussler (IAM Cyling) falling twice. Tinkoff-Saxo and Viviani’s Sky, along with Orica-GreenEdge, controlled the main bunch through the closing circuit as riders fell away behind, but it descended into a chaotic finish as the sprinters found themselves going it alone, with André Greipel (Lotto-Soudal) the first to launch his sprint in earnest. Hofland then moved round the German to look like he might take the day’s spoils, but it was the Italian Viviani who bided his time to nip past Hofland’s right side for his first Grand Tour win. 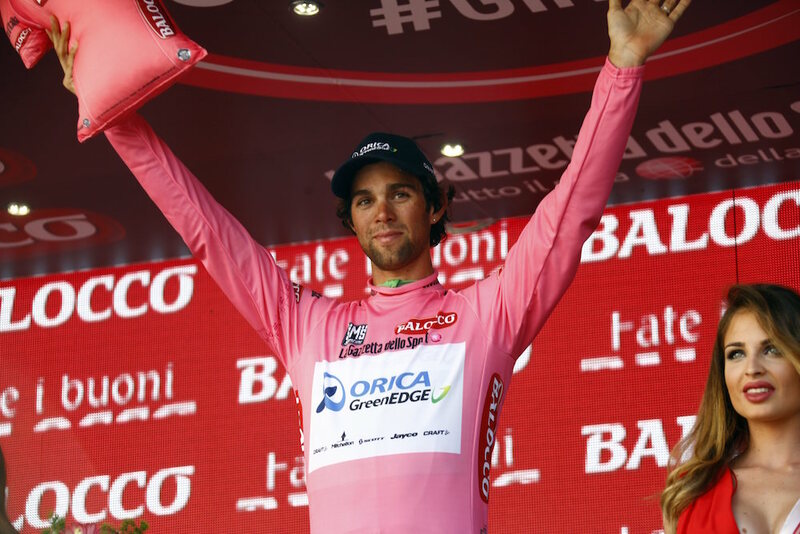 Michael Matthews (Orica-GreenEdge) took over the leader’s pink jersey from teammate Simon Gerrans by virtue of finishing ahead of his compatriot, with Domenico Pozzovivo the only possible GC contender to lose out, finishing over a minute behind his rivals. Earlier in the day, the first and only break got away in first 10km of racing, with Marco Frapporti (Androni-Sidermec), Lukasz Owsian (CCC), Eugert Zhupa (Southeast), Giacomo Berlato (Nippo-Vini Fantini) and Bert-Jan Lindeman (LottoNL-Jumbo) working together to extend maximum gap of 9-12. The last remaining rider, Owsian, was dragged back with 11km to go on the final circuits in Genoa. The break contested every intermediate point for both the red jersey and blue mountains jersey along the way, with Lindeman in the first maglia azzurra of the 2015 race. 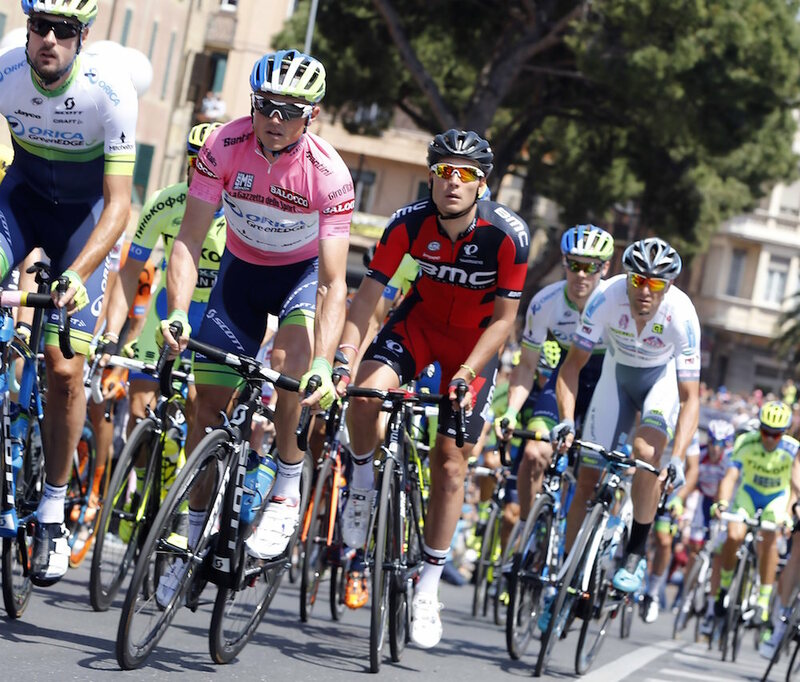 Monday’s stage three sees the riders hit the first serious hills of this Giro, with 136km into Sestri Levante. A category two climb will present problems for some of the sprinters, but there should be enough time to clamber back to the bunch with a fast 50km run into the finish from the Barbagelata climb.